Draft: 2015, San Francisco Giants, 2nd rd. Attended Christopher Columbus High School in Miami, FL (Alex Rodriguez spent his freshman year there). The Blue Jays selected him in the ninth round in 2011, but he did not sign and enrolled at the University of Miami, where he played baseball for the Hurricanes...Was also selected by the Nationals in the second round of the 2014 draft, but did not sign and chose to return to Miami for his senior year in order to earn his degree and attempt to improve his draft status for 2015....Growing up Andy played on a travel ball team that practiced every day at 6:30am; it was 50 minutes away. His parents shared the driving duties...He has a degree in criminology with a minor in psychology from the University of Miami. He got interested in psychology by working with the sports psychologist at Miami. He learned to slow the game down with breathing exercises and other techniques. He continues to read about stress management and mental strength...Andy and his younger brother, Kevin, played in Cooperstown tournaments. His family would drive 26 straight hours in their minivan to get there. Completed his first season with San Francisco, going 7-13 with a 4.49 ERA (80er, 160.1ip) in 29 starts...Among NL rookie qualifiers he ranked first in games started (29) and innings pitched (160.1ip), tied for fourth in wins (7), fifth in strikeouts (130), seventh in opponents' batting average (.269) and ninth in ERA (4.49)...His 130 strikeouts were the seventh-most in SF-era history (since 1958) and the most by a Giants rookie pitcher since Tim Lincecum had 150 in 2007...Had his contract purchased from triple-A Sacramento on April 11 and made just one start before being optioned back to triple-A...placed on the taxi squad April 30 and recalled May 1...stuck on the Giants' roster as Johnny Cueto was lost to the injured list for an extended period of time with a right elbow sprain...Began his big league career by retiring 10 consecutive batters before Ketel Marte hit a single through the middle in the 4th inning...received a no decision after logging 5.1 innings and allowing four runs on four hits with seven strikeouts...was optioned back to triple-A after the game...Became the sixth pitcher to make his MLB debut in a start for the Giants over the last 10 seasons (2009-18)...Earned his first Major League victory on May 6 at Atlanta...allowed one run (unearned) on seven hits over 5.1 innings...Received three or fewer runs of support in 22 of his 29 starts...Allowed two walks or fewer in each of his first 14 starts, the longest such streak by a Giants starting pitcher to begin his big league career since Hi Bell also did it in 14-straight starts from June 18, 1932 to July 4, 1933...Had a 1.95 ERA (16er, 73.2ip) in Giants wins and a 6.65 ERA (64er, 86.2ip) in Giants losses...In a four-start span from Aug. 14-31, he pitched 6.0+ innings while allowing three hits or fewer...the last NL rookie to do that three times in a four-start span in a single season was the Dodgers' Orel Hershiser in 1984...Had consecutive starts of 7.0-shutout innings on August 25 vs. Texas and August 31 vs. New York-NL...Threw a career-high 7.2 innings at SD on September 17...allowed two runs on four hits in a 4-2 victory. Named a MILB.com Organization All-Star after combining for a 10-10 record and a 3.30 ERA in 26 games (24 starts) between double-A Richmond and triple-A Sacramento... Posted a 4-4 record with a 2.96 ERA (22er, 67.0ip) in 11 starts for double-A Richmond. Began the season with single-A San Jose and made five starts, going 2-1 with a 2.43 ERA (8er, 29.2ip) and 34 strikeouts. Was promoted to double-A Richmond in May and posted a 7-7 record with a 3.95 ERA (50er, 114.0ip) in 19 starts for the Flying Squirrels. Finished the season tossing 15.0-scoreless innings over his final two starts. Recorded double-digit strikeouts twice this season (10 on April 28 with SJ and 10 on July 18 with RIC). Posted a 2-0 record with a 1.60 ERA (7er, 39.1ip) over 11 games (eight starts) for the Arizona Rookie League Giants (three games), Salem-Keizer Volcanoes (five starts) and San Jose Giants (three starts). Allowed one run or fewer in six of his eight starts. 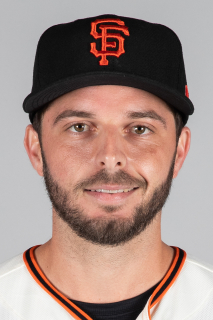 March 26, 2019 San Francisco Giants optioned LHP Andrew Suarez to Sacramento River Cats. May 1, 2018 San Francisco Giants recalled LHP Andrew Suarez from Sacramento River Cats. April 20, 2018 LHP Andrew Suarez assigned to Sacramento River Cats from San Jose Giants. April 16, 2018 LHP Andrew Suarez assigned to San Jose Giants from Sacramento River Cats. April 12, 2018 San Francisco Giants optioned LHP Andrew Suarez to Sacramento River Cats. April 11, 2018 San Francisco Giants selected the contract of Andrew Suarez from Sacramento River Cats. April 3, 2018 LHP Andrew Suarez assigned to Sacramento River Cats from San Jose Giants. March 23, 2018 LHP Andrew Suarez assigned to San Jose Giants from Sacramento River Cats. January 25, 2018 San Francisco Giants invited non-roster LHP Andrew Suarez to spring training. June 13, 2017 LHP Andrew Suarez assigned to Sacramento River Cats from Richmond Flying Squirrels. April 7, 2017 LHP Andrew Suarez assigned to Sacramento River Cats. February 1, 2017 LHP Andrew Suarez assigned to San Francisco Giants. May 10, 2016 LHP Andrew Suarez assigned to Richmond Flying Squirrels from San Jose Giants. August 17, 2015 LHP Andrew Suarez assigned to San Jose Giants from Salem-Keizer Volcanoes. July 19, 2015 LHP Andrew Suarez assigned to Salem-Keizer Volcanoes from AZL Giants. July 5, 2015 San Francisco Giants signed LHP Andrew Suarez. July 5, 2015 LHP Andrew Suarez assigned to AZL Giants.